“The first four runs were all at the HOTC trial, the last two runs are at the DAKC trial. The first run is Miley getting her second leg (second qualification- just one more and she’ll move up to the next class!) in the Open Standard division. The second run is another Open Standard course which could have earned her the OA (Open Agility- it would’ve been the “third leg”) title but she knocked a bar off in the middle of the course. That’s never happened before! It is still a really nice run. The third run is of Miley finally getting her Open Standard title (She finally got that third leg!). Miley got a little confused on the table- she was supposed to sit but she just wanted to lay down! But I finally got her sitting and we kicked it into high gear to finish under time. Amazingly we still got first place on that run to go along with the title! The fourth run is Miley’s first run on an Excellent A Jumpers with Weaves (JWW) course. We were doing so good until I crossed her up right at the end to get a refusal on a jump which NQ’d us. Sorry Miley, we’ll get it next time! The fifth run in this video is Miley getting her first Q in an Excellent A standard course. We took it slow and steady to make sure we didn’t fall for any traps out there, but we still came away with 1st place. Wow!! I’m tired after watching Miley do all that agility. She is awesome. Kevin does a great job of trying to keep up with her. And I loved the beach video. Miley is such a smart girl, let Howie do all the hard work fetching and then steal the stick. I love watching videos and seeing pictures of Miley and Howie. You capture their little (or shall I say big) personalities so well. The fetch video was so cute…loved when Howie had to dig the frisbee out of the sand…Wow! fast swimmer too…I see how Miley works it with the stick, let’s Howie swim for it…smart! Hope I got who was who right. We have a bichon frise and she is a curly white powder puff of energy. Not to be fooled by her appearance…she is 18 pounds of sturdy friskiness. I love the agility video! I love it when little dogs do agility, they’re so fun to watch. My heeler mix is learning, and almost old enough to compete, and oh my goodness does she LOVE it. OMG, Miley is awesome!I also just came across your site and I love their videos! I felt like I was the one running with her! That is one super dog! Your dogs are so adorable. My husband and I had a Boston for two years and we recently lost him to cancer. We loved him so much and he was our baby. 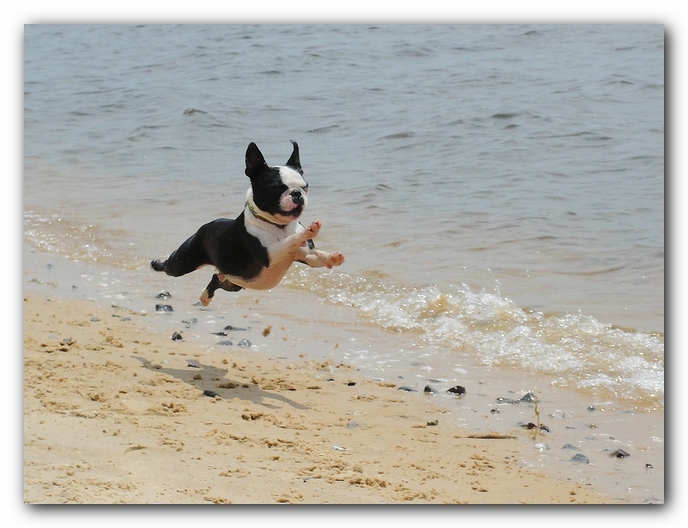 Looking at your dogs, I am so jealous at the fact that you have Bostons! They make such wonderful pets. Enjoy them and thanks for putting up their pictures to remind me of Cruiser! Your websites are so cute too. I’ve added them to my list on my site! My boys and I are totally in love with your gorgeous Miley and Howie, thanks for sharing these fantastic pics and vids! We have a Beagle x Cocker Spaniel named Rosie and we might have to try to train her to do the jumps it looks like great fun. Cheers Jane, Sam and Alex, Sydney Australia. What a Delight!! Fun watching — posted your Christmas YouTube for my family wishing them a “Boston Terrier Christmas”. Besides excellent videos your Bostons are incredible!